Interpreting is the process of simultaneous or consecutive representation of given oral information in other that a source language. I.e. if you speak Dutch and I will translate it straight in English it would be interpretation. The launch of the multilingual versions of the ‘Directory of Drug & Alcohol Services in Cork & Kerry’ took place on Thursday 20th of October in the Council of Chambers. Deputy Lord Mayor Councillor Fergal Dennehy attended the launch of the latest edition. The directory is produced by the Community Outreach Drug & Alcohol Awareness Project at Cork City Partnership and updated regularly. 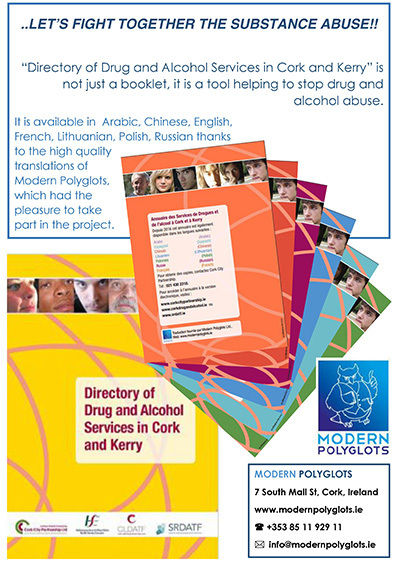 “Cork City Partnership welcomes the provision of HSE South funding to enable us to make this directory available in such a wide range of languages. It is important that our newer minority community members are supported to easily access information on drug and alcohol services.” said Brenda Cahill, CEO of Cork City Partnership. In the last number of years there has been a significant investment in drugs services across the region. With the directory now available in multi-lingual format, we aim to meet the information and service needs across all communities in the South. Around 2,000 people accessed the CLDATF services last year. The aim of the multilingual directory is to reach out to all communities. This directory contains available services for Drug and Alcohol misuse in Cork and Kerry. It has been created by Cork City Partnership in collaboration with HSE Ireland and translated by Modern Polyglots to seven languages in order to provide it to the general public. Modern Polyglots is proud to have to have undertaken this project and willing to participate in similar ones in the future. We are grateful to all our staff and freelances who took part in the project and made it possible. Please find booklets here. You'll get good service and consistent professional quality at a very reasonable cost. EVEN THE BEST TRANSLATORS sometimes make mistakes. That is why thorough checking procedures to pick up "human errors" are vital. As obvious as this seems, it is not always the practice in the industry, both here in Ireland and abroad. It is however, the standard for Modern Polyglots, and our translation and typesetting quality control procedures have proven highly successful over the years in eliminating errors and maintaining professional standards. Copyright © 2019, Modern Polyglots. Developed by GDV Web Solutions.